Dr. Hellinger is Associate Professor of Radiology and Pediatrics and Director of the Advanced Imaging and Informatics Laboratory, Departments of Radiology and Pediatrics, Stony Brook Long Island Children’s Hospital, Stony Brook University School of Medicine, Stony Brook, NY; and Dr. Epelman is Assistant Professor of Radiology, Director of Neonatal Imaging, Department of Radiology, The Children’s Hospital of Philadelphia, University of Pennsylvania School of Medicine, Philadelphia, PA.
Standard MRI protocols utilize high resolution, ultra-fast static and dynamic cine 2-dimensional T1- and T2-weighted (T1W and T2W) sequences.8,9 Using 2-dimensional MRI, multiple acquisitions, in multiple planes are often required to ensure complete anatomical coverage. The number of acquisitions and the exam time are directly dependent upon fetal movement, with the total number of sequences often ranging between 20 to 25, yielding an average exam time of 30 to 55 min. As with ultrasound, interpretation is often based upon mental reconstruction of the anatomy and pathology from the multiple acquisitions; communication, treatment planning and family counseling frequently require displaying multiple sequences. 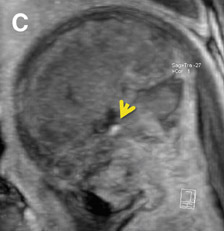 Clinical utilization of FMRI sequences have 2 essential requirements: 1) fast temporal resolution to account for fetal movement; 2) high, tissue signal-to-noise ratio (SNR), given the inability to administer gadolinium-based contrast agents. 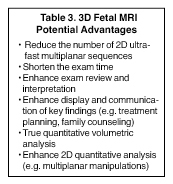 Of the commercially available 3-dimensional MRI sequences, 2 meet these criteria. One is gradient echo imaging with balanced steady state preservation of residual transverse magnetization (steady state free precession, SSFP).11 The other is volume interpolated (VI) gradient echo imaging.12 Three-dimensional SSFP (Figure1) is applied to depict fluid-sensitive material and structures, including amniotic fluid, placenta, cord, brain, ventricles, spinal canal, airway, lungs, pleural space, heart, aorta, kidneys, ureters and bladder. When using this sequence, the relative T2/T1 hyperintensity provides high tissue contrast between the viscera, placenta and amniotic fluid. Three-dimensional SSFP is also useful for depiction of the bowel, liver, spleen, the spine and extremities. Three-dimensional VI (Figure 2) is useful for depiction of T1-sensitive material and solid viscera including meconium, hemorrhage, placenta, bowel, liver, spleen, thyroid gland and the pituitary gland. For all 3-dimensional FMRI acquisitions, it is imperative to prescribe the parameters and image coverage such that the scan time is <10 to 15 sec, while spatial resolution and SNR are maximized. Depending on the gestational age, potential space in the amniotic cavity and the maternal fasting status, scan times >10 to 15 sec will increase the potential opportunity for fetal motion (Figure 3). Exam coverage should be restricted to no more than the boundaries of the uterus. Thin-section images are ideal for high spatial resolution, but at the expense of longer scan times and reduced SNR. Increasing the matrix and repetition time will improve SNR, but will also increase the scan time. Advanced visualization techniques are fundamental to 3-dimensional FMRI clinical applications (Table 4). To maximize the clinical potential of these sequences, it is essential that either the interpreting radiologist or a trained technologist has the understanding and skill to employ workstation techniques and tool functions to manipulate the datasets in multiple projections and formats and perform accurate 2- and 3-dimensional quantitative analyses. 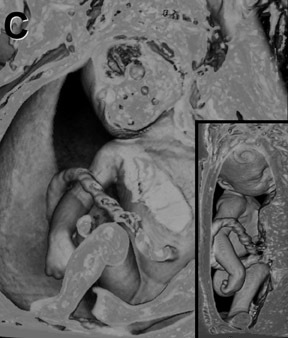 The post-processing operator should also understand the unique challenges in applying workstation techniques and tool functions to fetal and related gestational anatomy. The 3-dimensional MRI datasets are transferred to a workstation, which may be integrated into a picture archiving and communications system (PACS) or exist as independent systems (thin-client or standalone units). 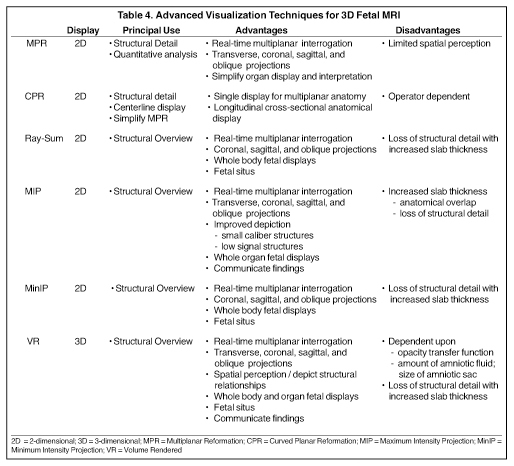 For state-of-the-art workstations, there are 6 visualization techniques which can be applied for 3-dimensional FMRI post-processing (Table 4): multiplanar reformation (MPR), curved planar reformation(CPR), thick MPR (Ray-Sum), volume rendering (VR), maximum intensity projection (MIP) and minimum intensity projection (MinIP). Each are applied in a complementary manner, based upon the operator’s need for structural detail vs. structural overview, and the advantages that each particular technique provides — applications are avoided in situations which expose the disadvantages of a technique. 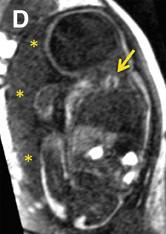 From this perspective, interactive use of the techniques forms the basis for real-time interpretation and display, while generation of protocol-driven post-processed images and batch reconstructions enables PACS review of static fetal anatomical displays along with review of reformatted coronal, sagittal and oblique fetal projections. It is important to keep in mind that the success of applying each of these techniques is dependent upon the image quality of the 3-dimensional FMRI sequence (Figure 3). MPR is the core technique for multiplanar assessment of structural detail and generation of 2-dimensional and volumetric (organ,lesion or whole body) measurements (Figures 3 and 4). By nature of this technique, the operator “slices” through the volumetric data with imited spatial perception. 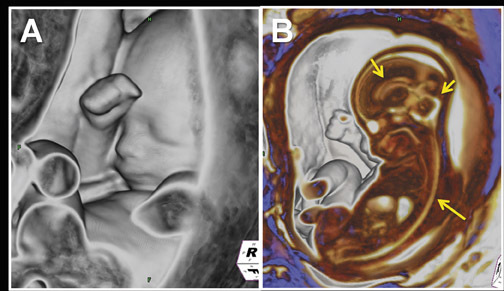 Longitudinal cross-sectional 2-dimensional CPR static or rotational displays can improve spatial resolution of gestational anatomy, without loss in detail. CPR images are produced by manually drawing a centerline through the anatomical region of interest. Determining fetal position, abdominal and thoracic situs, and visceral localization are key to recognizing and understanding fetal abnormalities. Ray-Sum, MinIP and VR techniques can be applied to determine fetal position. Manipulation of VR window-level settings or alternatively applying MPR or thin-slab MIP are the techniques of choice to then assess thoracic and abdominal situs and anatomical relations (Figures 5, 10, 11). Multiplanar, anatomical projections are essential for assessment of the fetal supratentorium, posterior fossa, brain stem and spinal cord and canal. 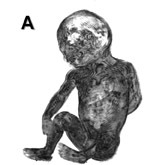 The 3-dimensional SSFP sequence is valuable in this regard to manipulate 1 sequence and swiftly depict gross anatomy (Figure 1, 13B) and pathology, as well as quantify fetal biometry. Depending upon the acquisition’s spatial resolution and degree of motion, as well as the size of the abnormality, dorsal induction (encephalomyelocele); ventral induction (holoprosencephaly); cellular division and differentiation; migration anomalies; and ventricular system abnormalities may all be defined more efficiently with MPR and thin-slab MIP (Figure 9C).14 The 3-dimensional VI sequence is reserved for evaluation of the pituitary gland (Figure 2). Similar to 3-dimensional US, 3-dimensional SSFP sequences can generate detailed VR surface images of normal craniofacial anatomy(Figure 13A) and anomalies, including cleft lip, cleft jaw, cleft palate, micrognathia (Figure 14), hypertelorism and hypotelorism.14 Once localized with VR, the abnormality is assessed with MPR, thin-slab MIP or both. Fetal neck pathologies which may lend themselves to 3-dimensional FMRI evaluations include vascular malformations (e.g. lymphangiomas), masses (e.g. teratomas) and thyroid goiters.7,14 The fluid-filled airway in the neck is readily assessed with 3-dimensional SSFP to exclude intrinsic (e.g. congenital high airway obstruction syndrome,CHAOS; Figures 15A-B) or extrinsic obstruction (e.g. masses). Three-dimensional VI can be applied to evaluate the thyroid gland (Figure 2)and potentially could be relied upon to exclude hemosiderin deposition in the neck (e.g. hemorrhage, vascular malformation). 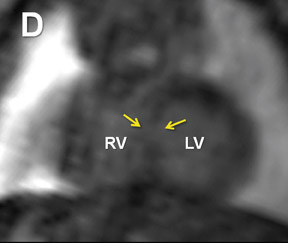 Fetal echocardiography remains, at present, the modality of choice for evaluation of fetal congenital heart and vascular disease. 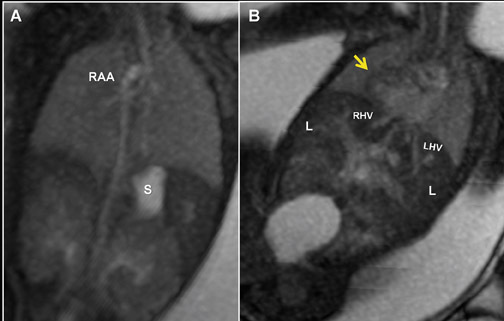 Two-dimensional SSFP has been shown to be a feasible means to evaluate CHD along with extracardiac anomalies, serving a complementary role to echocardiography.6,15 By acquiring the SSFP sequence volumetrically (e.g. 3-dimensional SSFP), cardiac and vascular morphology can be displayed in anatomical planes using MPR and thin-slab MIP, without projection artifacts (Figures 4, 11, 17). Due to the inherent nature of fluid in the genitourinary system, 3-dimensional evaluation of the kidneys, ureters, bladder and urethra is readily achieved with 3-dimensional SSFP (Figure 19). 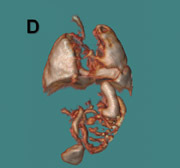 High tissue contrast yields robust MPR, MIP and VR reconstructions, such that renal hypoplasia, agenesis, duplication and urinary tract obstructions with hydro-ureter, hydronephrosis, or both, can all be assessed in 3-dimensional sequences.18 Additional applications include evaluation of adrenal and renal masses, renal cystic disease, urinoma and gender morphology (Figures 10 and 20). Evaluation of the spine, long bones, hands and feet is important in the assessment and exclusion of skeletal dysplasias and limb anomalies. A 3- dimensional SSFP sequence is manipulated to display complete and continuous anatomic axial and appendicular segments using Ray-Sum, MinIP, VR, MPR and/or MIP techniques (Figures 1D, 1J, 5A-C, 7D-E, 8). As demonstrated with 3-dimensional fetal ultrasound,19 the anatomical displays enhance skeletal visualization and surveys, providing greater diagnostic confidence and understanding of the type and extent of abnormalities. Three-dimensional SSFP is also valuable for the assessment of soft-tissue masses. 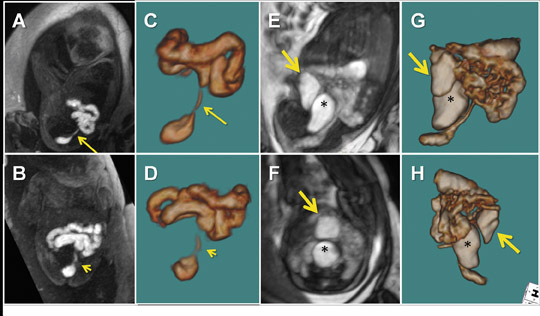 Volumetric 3-dimensional FMRI sequences are useful for displaying fetal anatomy and recognizing pathology in a wide spectrum of clinical applications. Successful utilization requires optimized image quality and understanding of advanced visualization techniques. Continued evidence-based investigation is required to determine the impact of 3-dimensional FMRI on fetal diagnosis and management. Goncalves LF, Lee W, Espinoza J, Romero R. Three- and 4-dimensional ultrasound in obstetric practice: Does it help? J Ultrasound Med. 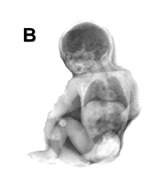 2005;24:1599-1624.
de Paula CF, Ruano R, Campos JA, Zugaib M. Placental volumes measured by 3-dimensional ultrasonography in normal pregnancies from 12 to 40 weeks’ gestation. J Ultrasound Med. 2008;27: 1583-1590. Chan LW, Fung TY, Leung TY. Volumetric (3D) imaging reduces inter- and intraobserver variation of fetal biometry measurements. Ultrasound Obstet Gynecol. 2009;33:447-452. 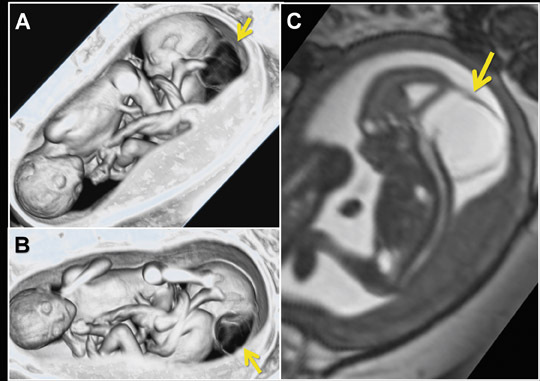 Merce LT, Barco MJ, Bau S. Three-dimensional volume sonographic study of fetal anatomy: Intraobserver reproducibility and effect of examiner experience. J Ultrasound Med.2008;27:1053-1063. Behairy NH, Talaat S, Saleem SN, El-Raouf MA. 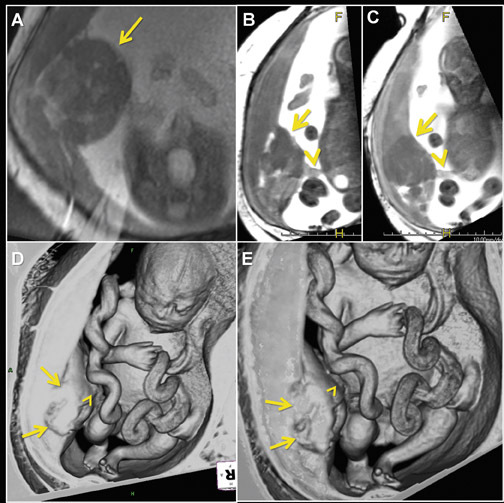 Magnetic resonance imaging in fetal anomalies: What does it add to 3D and 4D US? Eur J Radiol 2010;74:250-255. Manganaro L, Savelli , di Maurizio M, et al. 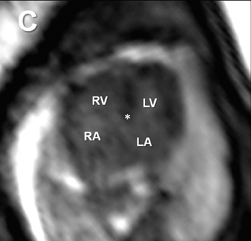 Assessment of congenital heart disease (CHD):Is there a role for fetal magnetic resonance imaging (MRI)? Eur J Radiol 2009;72:172-180. Pugash D, Brugger PC, Bettelheim D, Prayer D. Prenatal ultrasound and fetal MRI: The comparative value of each modality in prenatal diagnosis. Eur J Radiol. 2008;68:214-226. 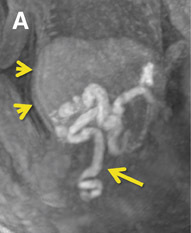 Prayer D, Brugger PC, Prayer L. Fetal MRI: Techniques and protocols. Pediatr Radiol. 2004;34: 685-693. 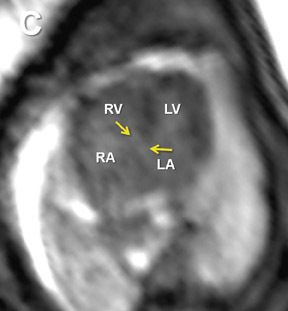 Levine D. Obstetric MRI. J Magn Reson Imaging. 2004;24:1-15. Hatab MR, Zaretsky MV, Alexander JM, Twickler DM. 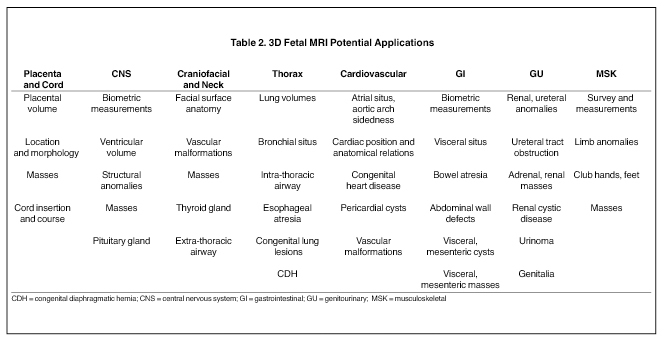 Comparison of fetal biometric values with sonographic and 3D reconstruction MRI in term gestations. AJR Am J Roentgenol.2008;191:340-345. Anquez J, Angelini E, Bloch I, et al. 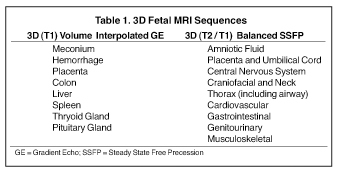 Interest of the steady state free precession (SSFP) sequence for 3D modeling of the whole fetus. Conf Proc IEEE Eng Med Biol Soc. 2007:771-774. Inaoka T, Sugimori H, Sasaki Y, et al. 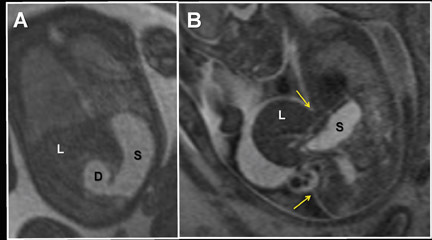 VIBE MRI for evaluating the normal and abnormal gastrointestinal tract in fetuses. AJR Am J Roentgenol. 2007;189:W303-308. Huisman TA, Solopova A. MR fetography using heavily T2-weighted sequences: Comparison of thin- and thick-slab acquisitions.Eur J Radiol. 2009;71: 557-563. 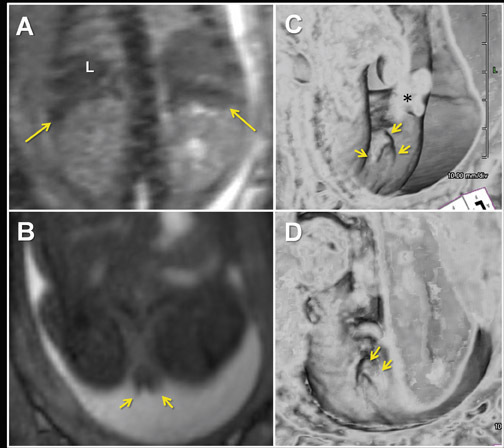 Herman-Sucharska I, Bekiesinska-Figatowska M, Urbanik A. Fetal central nervous system malformations on MR images. Brain Dev. 2009;31:185-99. Manganaro L, Savelli S, Maurizio M, et al. 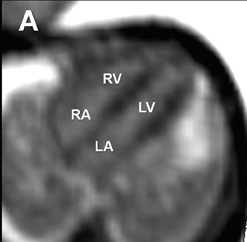 Fetal MRI of the cardiovascular system: Role of steady-state free precession sequences for the evaluation of normal and pathological appearances. Radiol Med. 2009;114:852-870. Rubesova E, Vance CJ, Ringertz HG, Barth RA. 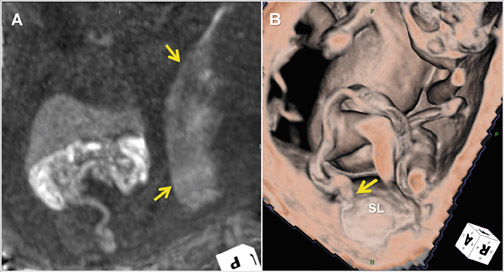 Three-dimensional MRI volumetric measurements of the normal fetal colon. AJR Am J Roentgenol. 2009;192:761-765. Hormann M, Brugger PC, Basassy C, et al. Fetal MRI of the urinary system. Eur J Radiol. 2006;57: 303-311. Nelson TR, Pretorius DH. Visualization of the fetal thoracic skeleton with three-dimensional sonography: A preliminary report. AJR Am J Roentgenol. 1995;164:1485-1488. 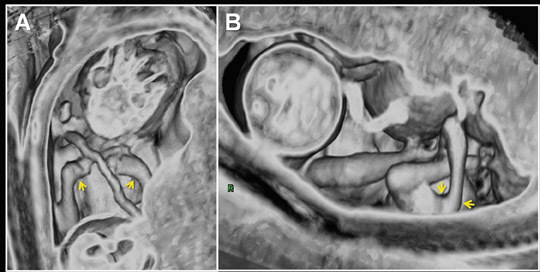 Fetal MRI in the Third Dimension. Appl Radiol.